PokerZebra shows you the odds that a Texas Hold'em hand will win against other hands. Use it to calculate your equity in a Texas Hold'em pot. 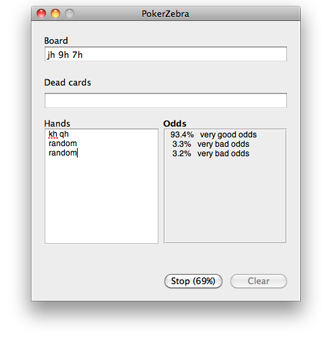 PokerZebra is the Mac OS X application that PokerStove users has been waiting for. Get your copy today! Instant results, easy to use. Make decisions in a snap. From the developer of Poker Copilot for Mac OS X, the best Mac OS X poker tracker app. Enter any board cards that are currently known, enter your hand, and enter your opponents' hands. 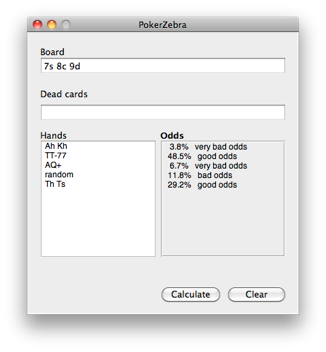 Click on "Calculate", and PokerZebra does an exhaustive calculation of all possible outcomes. 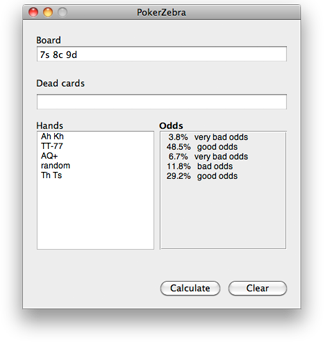 Calculating can take a long time so PokerZebra updates the odds regularly during the calculation. Possible outcomes are evaluated in a random order to make sure that the odds converge quickly to the final values. You can evaluate a hand against an opponent who has any two cards, by using the word "random". enter two specific cards, separated by a space: "Kh Qh"
an open range. "TT+" means all pocket pairs with tens or higher. "A7+" means "AK,AQ,AJ,AT,A9,A8,A7"
a closed range. "77-KK" means "KK,QQ,JJ,TT,99,88,77"
multiple ranges separated by commas: "AA,AQs,77"
Copyright 2011. All rights reserved. Zebra picture by FastIcon.com. 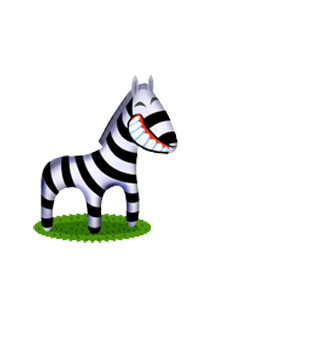 PokerZebra icon by Rob Benes.